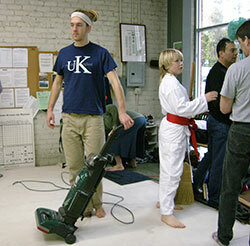 Originally Goto Sensei had scheduled Dojo Clean-Up Day late in December, about a month ago. But that was a day of torrential rain and serious flooding in Marin and Sonoma Counties, so the job was postponed to January 28. Sensei generated a great turnout for clean-up day by promising that work would be followed by a feast of authentic Mochi. All of this was preceded by two hours of class, first a weapons class followed by an hour of tai jutsu. Usually we have two weapons classes on Saturday morning, but the turnout for clean-up day was large, and there were a lot of kids, so Sensei elected to switch the second class to empty-handed training. We defended against a two-handed grab, ryote dori, and the first technique was tenchi-nage, or "heaven and earth" throw. This technique was one of the first moves I remember doing in Aikido. 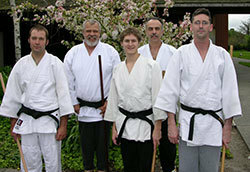 I was in my first week of training, and I had paid a visit to Richard Moon's Marin Aikido dojo in Fairfax. Near the end of class he walked over to me and my training partner who had grabbed me by the arms. I was in trouble trying to muscle uke with my upper body. It was not working, and Moon Sensei waited until I'd gotten hung up reaching too high with the upper hand. He said, "just relax and sink you body." I tried it and uke folded like a wet noodle. 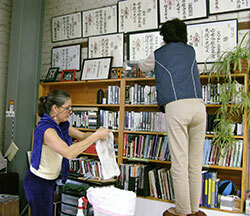 Moon Sensei laughed and said, "good, now just do that for the next five years or so and you'll make it to black belt." Back on the mat I'd gotten paired up with Ron, a strong Sandan who always seems to relish wailing on me. Since the mat was so crowded I had to look where I was going to fall a little before the throw because by the time Ron had begun uncoiling it would have been too late. We practiced training on a single tatami, about 3 feet by 6 feet, which Goto Sensei said was a common practice in Japan. Goto Sensei had us do four different kote-gaishis from ryote-dori. The last one was pretty exotic; a kind of quick, reverse kote-gaishi in which a sneaky plant of uke's hand into your outside palm leads immediately to a surprise throw. Goto Sensei said, "you'll probably never be asked to do this on a test," which led everyone, myself included, to mark it as "likely to be included" in our next tests. A great addition to class was the number of new students and kids who showed up to train. Many of the kids were children of other students who were there to clean up and eat Mochi. I ended up paired with Kevin, a youngster about 10 years old who must have stood no more than four feet tall. I prayed we wouldn't have to do shiho-nage. Sensei gave us a kokyu ho technique that involved extending hands while turning the direction of uke, then striking through to the rear. Kevin, all 70 pounds of him, stepped right through me with his hips and I went flying almost into the heater at the edge of the mat. 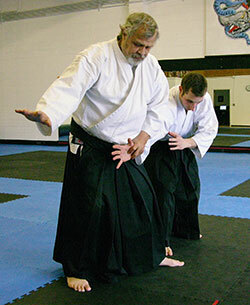 In Aikido size isn't everything, and actually ends up being a handicap most of the time. Soon enough class was over, we had changed clothes, and the brooms, dust cloths, and vacuums were in use, gathering up a year's worth of dust bunnies. I looked toward the bathroom, but Bob and John had already claimed it as their own. Failing to capture that job, I occupied myself with taking down high pictures and dusting high places that most people shorter than 6'5" can't reach. The kids were busy cleaning weapons, sweeping, wiping down windows, and vacuuming the mat. The scene was a bit chaotic, with each individual acting on some local purpose, but in aggregate appearing to move randomly like so many gas molecules in a bottle. 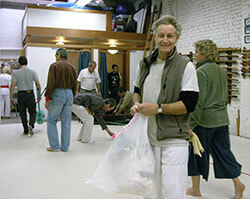 After most of the dust had been collected and banished, Sensei called out for the tarp to be laid out over the mat. This was the signal most everyone was waiting for because it meant that Mochi-making was about to begin. We brought out tables and surfaces for the Mochi-makers, and crates and plywood to serve as tables at which to eat. I was sure that Akiko San would be overseeing the Mochi project, and having never enjoyed fresh, authentic Mochi, I was disappointed that I would have to leave before any would be ready to eat. Apparently making good Mochi is a subtle art that most of us westerners can't slow down enough to be able to get right. As the Mochi ingredients were being assembled I had to leave, so the story of Akiko San's sublime Mochi will have to wait for another time. As I drove away I listened to the rumbling in my stomach and ruefully unwrapped a Cliff Bar. A dark car turned onto Condo Lane and moved toward the cul de sac where I was parked, in front of the Seika Ryu Kenpo dojo where we train Aikido. I looked and thought I saw Julian at the wheel and was happy. He would be bringing a key for me to get into the dojo, an arrangement we'd made last night by phone. The car turned around and parked behind me. As I got out onto the street I saw that it was Bryan instead, back from his year in Iwama. His "Ibaraki Bryan" blog had become very popular, and it provided us with a window on daily life training with Hitohiro Sensei that many of us found fascinating. But now Bryan's back in California, as it turned out, just in time to say good-bye to Tatoian Sensei on his way to the East. Shortly after, Eric's truck pulled up on the far side of the street, and there were three of us, enough to create a good workout. Eric walked up and handed me a key. Craig had given it to him, I suppose when the two were teaching the kids' class at Two Rock Dojo in Petaluma last night. We were in. I disabled the alarm, we turned on the lights (the place is cavernous), and got dressed. Julian did show up with a key, looking a little surprised to see us already in the dojo. Ever since Hitohiro Sensei was here in October I've been trying to make Tai No Henko look like a shomen sword strike. We practiced both and then did rounds of various techniques from a shoulder grab, kata dori. At one point Eric wriggled loose from Bryan's pin at the end of kata dori men uchi kote gaishi, and I remarked that it would probably turn out differently next time. Then I realized that it was my turn to take the ukemi next. Bad timing. My shoulder got planted like a redwood tree and I was tapping almost as soon as I hit the mat. As the hour wound down I was wishing for a couple of Advils; my body still is adjusting to being back in training, and the mat at Seika Ryu isn't the softest one around. But soon enough we were doing suwari kokyu-ho. Later, during a side trip to Costco, I made sure to load up on bottles of Glucosamine and Ibuprofin. I think they'll come in handy. This afternoon I got a call from Craig about how to keep the dojo alive now that Tatoian Sensei has left for the Phillipines. I'd been in a kind of dreamy, unfocused space (perhaps tinged with denial) since Sensei left last Tuesday to begin building his new life in Tagaytai, south of Manila. Craig's call moved the whole scene into sharp focus: there would be classes this week; what are we going to do about it? As we were coming up with a working strategy I flashed back to some scenes of Dennis Sensei from over the past decade or so. The first one that always comes up is his Zato Ichi impersonation. He has Shintaro Katsu's voice, mannerisms, and stumbling walk down to a perfect art. I'd first seen it at Lake Tahoe a few years ago in the cabin we all shared for the annual Memorial Day Gasshuku. Then - I think I blogged this - last year at a party given by the Swedes at Lake Tahoe he did a full-on performance. I managed to get parts of this on video, and the picture is a grab from one of the video frames. Tatoian Sensei is a natural showman, and he had members of about five dojos and a bunch of european visitors convulsing with laughter. Later he said that Japanese people are always astonished that a Gaijin can so perfectly impersonate one of their favorite movie characters. He even has the "yakuza speak" dialect, which I think he learned from his time in Iwama, down flawlessly. Other images flashed past, such as the time he put a guy to sleep in our old Rohnert Park dojo after the student repeatedly ignored Sensei's warnings not to do some dangerous thing. Also in that dojo, after class Sensei would come and sit with Carmen and me for up to an hour, videotaping our practice so that we could prepare more effectively for our upcoming shodan tests. His best advice for me at that time I can still hear clearly: "You know a little; show what you know." 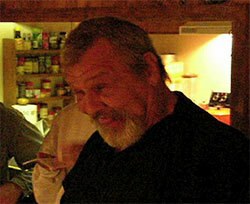 Sensei told me last week that he feels physically a lot better in the Phillipines, and that's good, because in the past few years he'd been hurting more and more from his deteriorating hip and other physical ailments, no few of which stem from his fall from an exploding helicopter during the Viet Nam War. Dennis Sensei was never happier than when some student would test him, attacking him viciously before, during, or after class. I never had the slightest impulse to go after Sensei, but others did, especially Jorge. When Jorge was about a third Kyu he began really trying to mess with Sensei, attacking him from behind, running at him from across the mat, punching, jumping on his back, etc. These episodes always ended badly for Jorge, usually within one or two seconds. One time I remember Jorge taking a swing at Sensei from the side. Instantly, his body flew half the width of the mat in an blinding fast exchange that had many elements of koshi nage, especially the extremely wide uke eyes. Forever after those days, Sensei has always loved Jorge, remembering him as one of his favorite all-time chew toys. 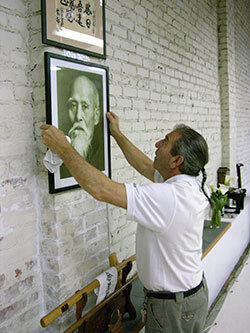 Jorge still would visit now and then in the new dojo space in Santa Rosa. Here's a picture of Sensei having more fun with Jorge from about a year ago. I will not be able to attend our special, outdoor weapons class until the middle of February, but we are going to try to keep that going also. Now that it's winter we'll be training under the overhang at the Rohnert Park Recreation Center where we used to have indoor classes in 2000 and 2001 after we got evicted from our old dojo space. Here's a photo of some of the usual suspects with Sensei, showing the overhang and protected practice space where we have weapons class. Dennis Sensei will be back in California a few times a year, and we have still an abundance of great teachers who have studied with Saito Sensei: Goto Sensei, Newens Sensei, Witt Sensei, Hendricks Sensei, Peuser Sensei, just here in the SF Bay Area. But Dennis Sensei's departure is a big loss to those of us who admired his single-minded loyalty to Saito Sensei and his Aikido. In his absence we could not do much better than to follow in that same spirit. Goto Sensei got us started, at the beginning of the first Aikido class of 2006, doing forward rolls the length of the mat. I inwardly groaned at this, since I'd been away from the dojo for three weeks and was feeling very stiff and inflexible. But, along with Akiko and Cory, I got down on my knees, worked my arms into a kokyu-circle, and. . . away we go. I got dizzy and crashed into a heater at the far end of the mat, then staggered getting up and crashed into the shoe rack. That was how my Aikido year, 2006 got off to a start. I'm sure Goto Sensei was greatly entertained by our suffering, but mercifully, he cut the exercise short and launched us into tai no henko. Here is a picture of Cory radiating his zanshin. We talked a little about Tatoian Sensei's impending departure to the Phillipines, where he'll hook up with some high-ranking teachers, including Hitohiro Saito Soke, and continue preparations for the construction of his new dojo south of Manila in Tagaytai. This trip, his second in six weeks, was supposed to be just another visit before his permanent relocation later this year. But when I talked with Tatoian Sensei earlier this week I had the weird feeling that he was just going to go next week and not come back. Over the holidays and during his November absence I'd grown out of touch with his dojo and his students, so I don't know what the situation is for continued training while Tatoian Sensei is gone. Maybe Bryan will look in and provide a comment. Meanwhile, today's training focused on katate dori ikkyo omote and ura, which seems like a fine way to begin the year. At roughly the beginning of the curriculum. We practiced stepping off to the side into hanmi, not just leaving the trailing foot out in the middle of the mat. 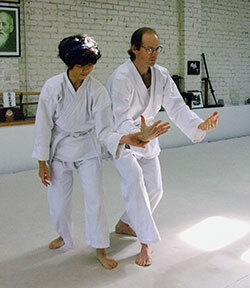 In the picture Goto Sensei is reminding us to make an atemi too. We practiced raising the grabbed hand as though holding a sword, which alleviated us from having to reach across and absurdly try to drag uke's hand across our bodies. Down that road lies rotator cuff surgery. At one point Goto Sensei had us all strike laterally and then front to back with a bokken. It was the exact motion he wanted us to make empty-handed for ikkyo omote. He said, "make your weapons training look like your tai jutsu, and make your tai jutsu look like your weapons training." 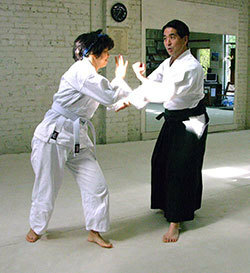 Soon he shifted us to ikkyo ura waza, and this involved a technical change allowing us to rotate our throws to the rear. I thought hard about how Hitohiro Sensei had taught ikkyo ura in October, and tried to extend uke as I captured the elbow, just before the throw. It was hit and miss, but we were all going very slowly and I think I saw where I was getting off track. I wasn't stepping in with the proper hip rotation as I entered to capture the elbow. "Do them simultaneously," Goto Sensei said. I tried it and the technique felt smoother. By the end of class at least two people had come into the dojo and taken information flyers, one of them asking about class times. It felt good to think that perhaps we might have some new training partners as the new year unfolds. O-Sensei: My students think I don't lose my center. That is not so; I simply recognize it sooner and get back faster. 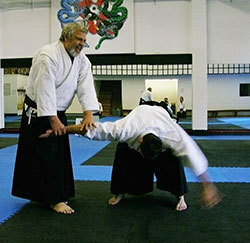 Morihiro Saito Sensei: Aikido is generally believed to represent circular movements. Contrary to such belief, however, Aikido, in its true KI form, is a fierce art piercing straight through the center of opposition. Furuya Sensei on Swordsmanship: Letting go of the idea of “sword” and the idea of “action” is the meaning behind “willow in the gentle breeze.” When the slight summer breeze blows, does the willow follow the “nature of the willow,” or does it follow the “nature of the breeze?” Please think about this - in this lies the essence of sword technique.